Pneumadyne’s extensive offering of pneumatic fittings includes a variety of thread to barb Straight Connectors, Elbows and Tees. 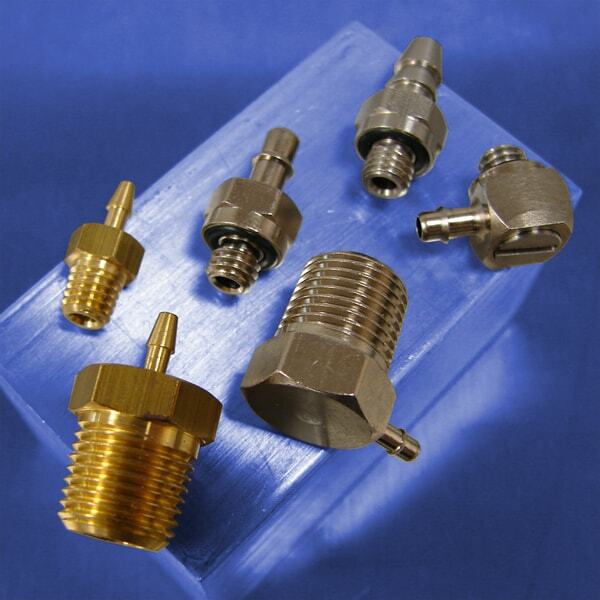 Our precision machined fittings feature thread sizes ranging from 10-32 UNF to 3/8 NPT and barbs for use with 1/16 to 3/8 tube Id. Pneumadyne is a manufacturer of standard miniature pneumatic fittings. 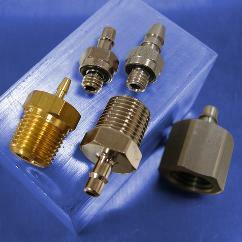 We can also assist you with design and engineering of custom pneumatic components or full pneumatic control systems. Read below for more information or contact Pneumadyne today. Two styles of barbed fittings are manufactured to accommodate tubing requirements and installation preferences. It is our experience that softer, polyurethane tubing works better with a single-barb design while the double-barb is preferred for harder tubing such as polyethylene. Our Pneu-Edge® fittings feature a consistently sharp, single-barb design which provides a tighter grip and seal which ensures permanent polyurethane tubing installation without the need for clamps. A smaller shank behind the barb allows the tubing to relax creating a tighter fit. Our double-barb design features durable brass barbs with the sharpness required to maintain connection even in high pressure and vibration applications. Pneumadyne fittings with 10-32 and ¼-28 UNF threads feature our captured o-ring design. When properly installed, the skirt around the o-ring allows the fitting to mechanically seat on the rim of the female thread and hold the fitting tight. The buna-n o-ring is captured inside the skirt of the fitting, concealing from view and providing a clean looking connection. The result is a superior seal which ensures a leakproof fit even when mated with a less than perfect sealing surface. When torqued down, the mechanical fit keeps the fittings tight and retains its position even under constant vibration. The captured o-ring design also eliminates the need for replacement gaskets or washers. Straight Connectors with 1/16, 1/8 and .170 tube Id barbs and 10-32 threads are also available with our tapered thread design. 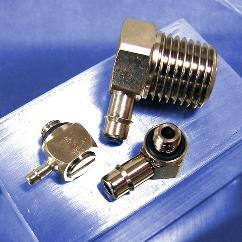 This unique thread design eliminates the need for a soft seal undercut at the base of the fitting and produces a seal similar to pipe thread. The absence of the undercut also allows for a larger than normal orifice permitting more flow. Tapered threads are sturdier than thin walled 10-32 fittings and can be used in conventional straight female threads as well. 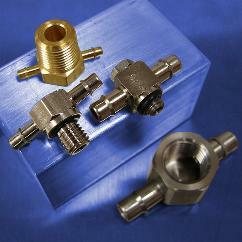 Pneumadyne’s threads to barb fittings are ideal for use in a wide variety of applications. In addition to installing them in a valve port, our fittings can be used with a pneumatic controls manifold to create a clean and organized distribution point for fluids or gases within your fluid handling system.